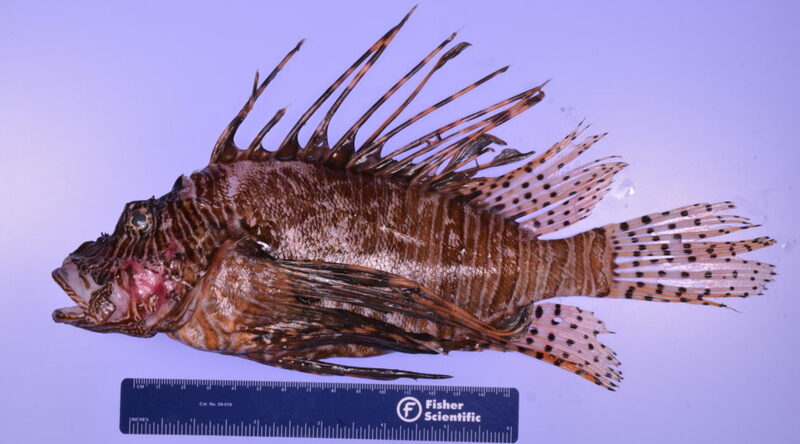 In mid-August 2017, the FWC Division of Marine Fisheries Management’s lionfish group contacted the Fish and Wildlife Health Staff to confirm they collected lionfish (invasive Indo-Pacific lionfish Pterois volitans/miles complex) with significant ulcerative skin lesions approximately 30 miles off Pinellas County. Ulcerated lionfish were also documented offshore Pensacola by local divers on Aug. 5. Following these initial reports, lionfish presenting with ulcers have also been reported in waters of the, East Florida Shelf, the Florida Keys, and the Bahamas as well as throughout the Caribbean Sea, including offshore of the Cayman Islands, Bonaire and Belize. FWC’s Fish and Wildlife Health group are collaborating with UF and Okaloosa County to obtain specimens and conduct necropsies to determine the etiology of the disease. In conjunction with UF, FWC have evaluated the specimens for parasitic infection as well as bacterial, fungal and viral infection. This ongoing research is critical because the pathogen could be non‐specific and impact other marine sport fish species. Histological analysis has demonstrated tissues that appear to be healing. A causative agent has not been identified, but FWC continue to receive periodic reports of ulcerated fish and try to get specimens for analysis as they become available.